Yellow Tomato & Basil Pesto Pizza Fill 1 Created with Sketch. This crowd-pleasing pizza gets a sunny twist from yellow tomatoes cooked into a simple sauce with garlic, whose sweet, mellow flavor gets delicious contrast from herbaceous basil pesto dolloped on top just before serving. Remove the dough and honey from the refrigerator to bring to room temperature. Preheat the oven to 475°F. Place the tomatoes in a bowl; gently break apart with your hands. Peel 1 clove of garlic; using a zester, finely grate into a paste (or use the small side of a box grater). In a large pan (nonstick, if you have one), heat 1 teaspoon of olive oil on medium-high until hot. Add the tomatoes and garlic paste; season with salt and pepper. Cook, stirring frequently, 4 to 5 minutes, or until slightly thickened. Turn off the heat. Taste, then season with salt and pepper if desired. While the sauce cooks, lightly oil a sheet pan. 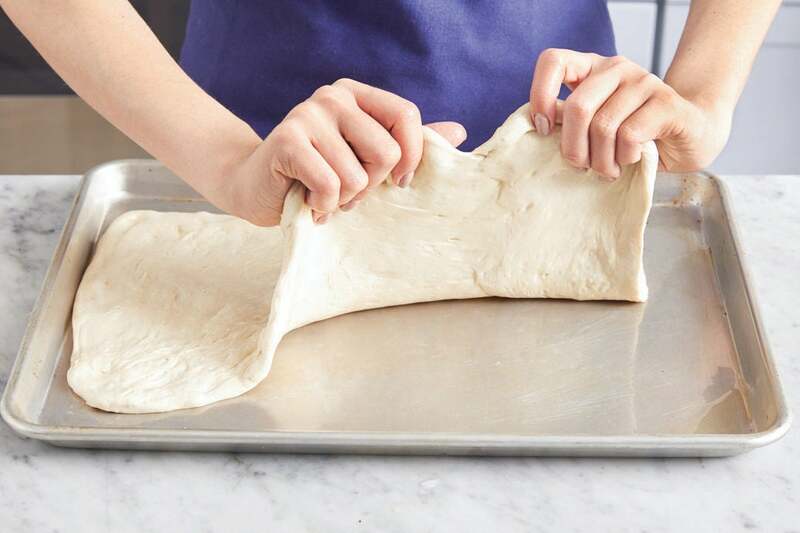 Using your hands, gently stretch the dough to about 1/4-inch thickness. 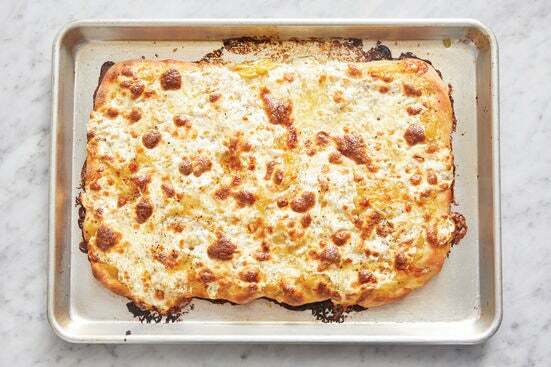 Carefully center the dough on the sheet pan. Shape towards the edges of the pan, maintaining an even thickness (if the dough is resistant, let rest 5 minutes). Leaving a 1-inch border around the edges, evenly top the prepared dough with the sauce, mozzarella (tearing into small pieces before adding), and fontina. Season with salt and pepper. Remove the leaves of the cauliflower; cut lengthwise through the stem into 1-inch-thick steaks (keeping them as intact as possible). 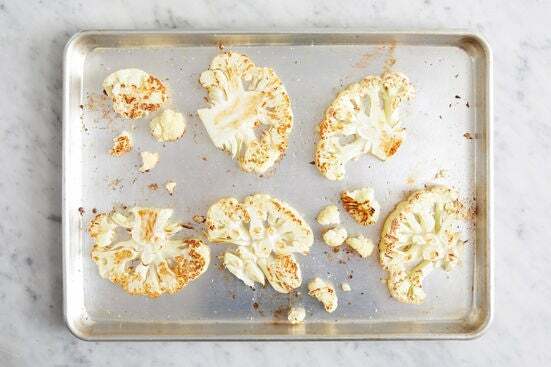 Place the cauliflower steaks on a sheet pan. Drizzle with olive oil and season with salt and pepper. Carefully turn to coat and arrange in an even layer. Roast 25 to 27 minutes, or until lightly browned and tender when pierced with a fork. Remove from the oven. 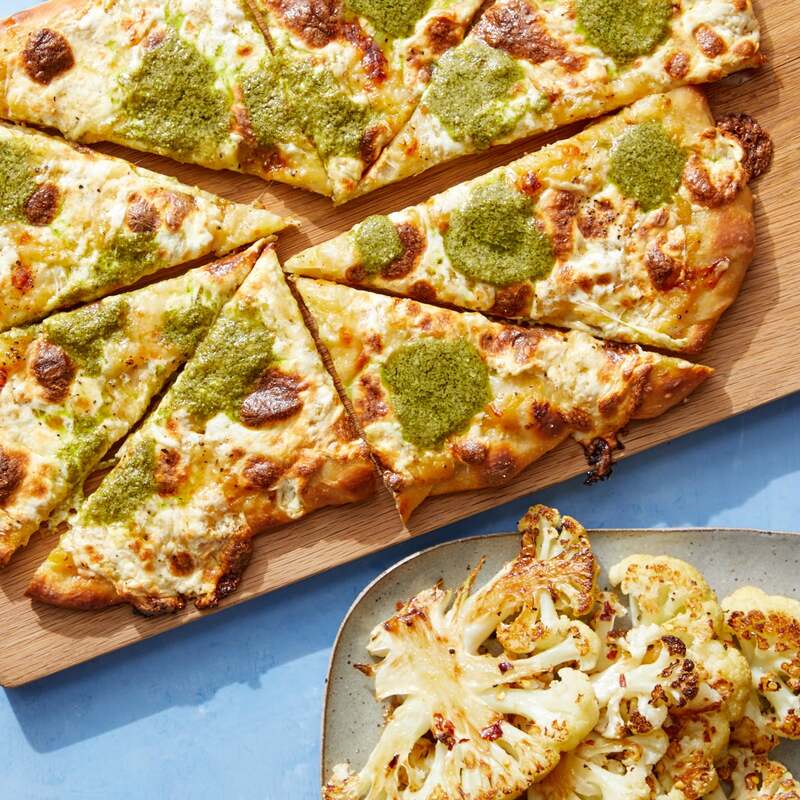 While the cauliflower roasts, bake the pizza, rotating the sheet pan halfway through, 20 to 22 minutes, or until the crust is golden brown and the cheese is melted. Remove from the oven and let stand at least 2 minutes. While the pizza bakes, in a large bowl, whisk together the honey (kneading the packet before opening), 1 teaspoon of warm water, and as much of the red pepper flakes as you’d like, depending on how spicy you’d like the cauliflower to be. 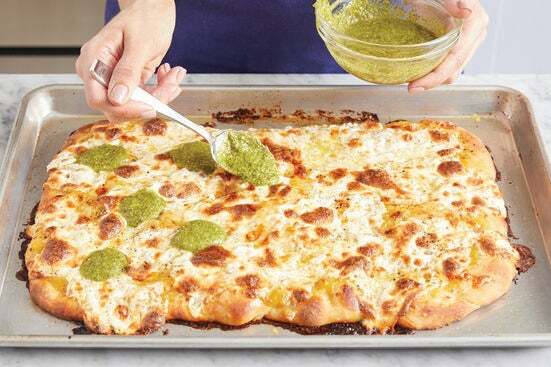 Evenly top the baked pizza with the pesto. Carefully transfer to a cutting board and cut into equal-sized pieces. Add the roasted cauliflower to the bowl of hot honey; turn to coat. 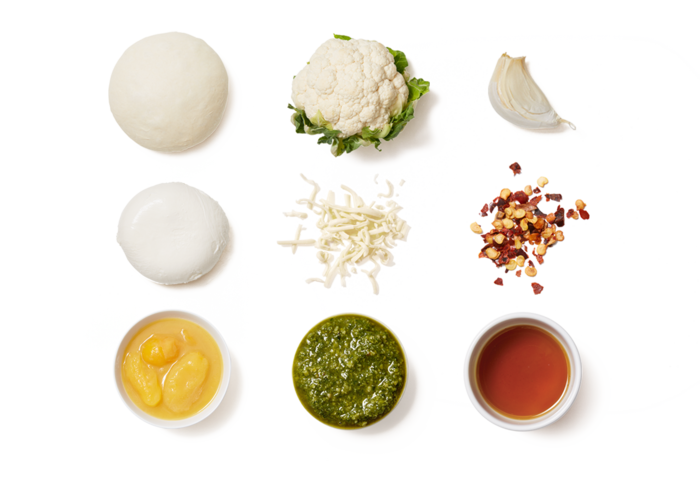 Serve the finished pizza with the finished cauliflower on the side. Enjoy!